The Iran Deal is designed to prevent Iran from enriching uranium to develop a nuclear weapon. If Iran complies with the agreement, they will get relief from sanctions that brought them to the negotiating table during the Obama administration. Congress is expected to vote on approval of the Iran Deal as early as Sept. 9. Congressman Loebsack has not made a public statement on the matter, hence a concern of those assembled. The gathering began with Dawn Jones, Wellman, serving as master of ceremonies. Jones helped organize the demonstration, which is part of a nationwide series of similar events under the MoveOn.org umbrella. At one point 55 people were in attendance, as well as the local FOX News/CBS Channel and a couple of videographers. Dr. Maureen McCue, Oxford, board member of the University of Iowa Center for Human Rights and chapter organizer for Iowa Physicians for Social Responsibility, enumerated the benefits of the Iran Deal and urged Loebsack to vote for the bill. (Details of the Iran Deal are linked at this July 27 post). 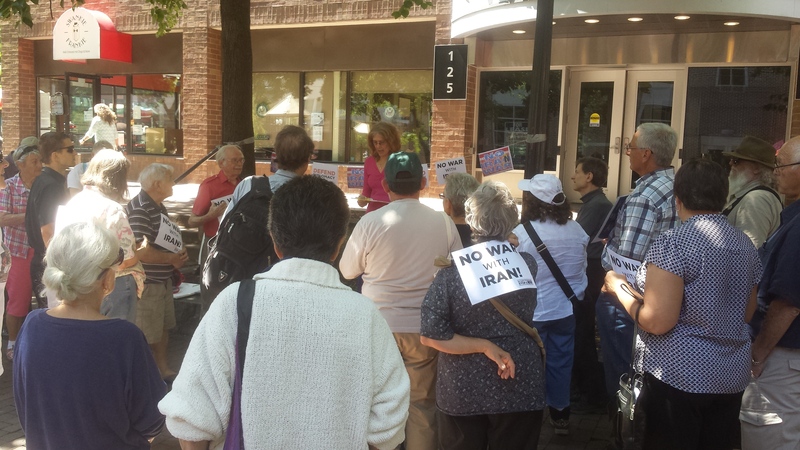 Tom Baldridge, advocated for the Iran Deal on behalf of the Eastern Iowa Chapter of Veterans for Peace, as did Ann Stromquist of PEACE Iowa, Nancy Porter, John Rachow, Dan Daly and others. After the speeches, Jones walked into the office and spoke to Dave Leshtz, district representative for Loebsack. 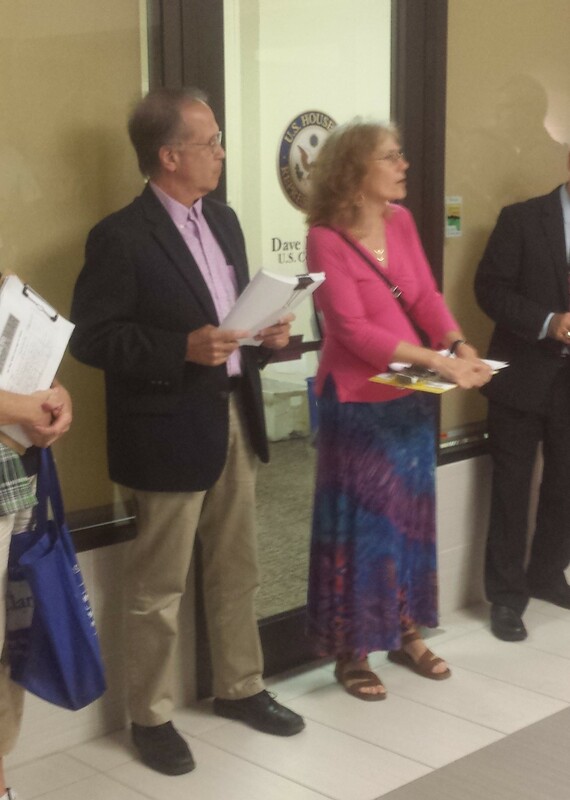 The group was invited inside to present a petition calling for an aye vote on the Iran Deal. The frustration of several in the group was that Loebsack had not taken a leadership position by speaking for the Iran Deal well in advance of the vote. Some hoped he could influence his colleagues in the lower chamber. Dan Daly, Iowa City, stressed that many in the room had helped Loebsack get elected in 2006. “We want to stay positive. Urgency. Take action. Soon and very vividly, so more congresspeople can take cover behind his leadership,” Daly said. Leshtz deferred to the congressman, who knows many of the demonstrators personally. Both Iowa U.S. Senators Chuck Grassley and Joni Ernst are expected to vote “no” on the measure. This entry was posted in Nuclear Abolition and tagged Dave Loebsack, Nuclear Abolition. Bookmark the permalink.